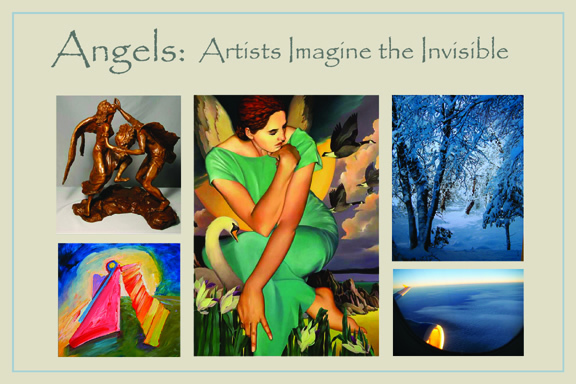 Just in time for the winter holidays, Arts of the Covenant presents their group exhibition, Angels: Artists Imagine the Invisible, in the East Gallery. 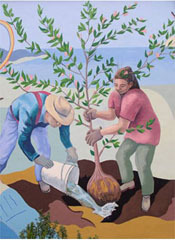 The exhibit extends through December 5, 2009. The opening reception will be held Friday, October 30, from 7 to 9 pm, with music provided by Gabriel’s Trio, featuring a trumpet fanfare and flugelhorns. Children’s angel activity booklets will be available at the reception, and, weather permitting, you can also have your photo taken wearing angel wings and become part of this wonderful event. The art history of almost all cultures reveals a belief in angels. Even nonbelievers have experienced inexplicable moments of grace when unlooked-for gifts from the universe suddenly manifest or when premonitions help smooth the way. Theologians and philosophers have argued over what angels look like, but it has been artists who were inspired to imagine and depict spiritual beings usually invisible to human sight. From the Winged Victory of Samothrace and the great religious paintings of the Renaissance to the graffiti of New York artist Keith Haring, angel imagery strikes an immediate chord with audiences of all ages. The artists participating in this show have explored a broad range of artistic treatments and iconography to visualize these evanescent beings that act as intermediaries between heaven and earth. The exhibition presents the work of beginning and emerging artists, and art teachers, whose insights and interpretations will inspire viewers. Among them are painters Albert Smith and Jacqueline Osborn, bronze sculptor Dorothy Gager, book illustrator Eric Minoura, collage artist Joyce Savre, poet Dianne de Laet, and Dr. Doris Arrington, professor of art therapy at Notre Dame de Namur University. "The range of media in this exhibition, its complexity, and its beauty will engage the art connoisseur, and its spiritual import should encourage people to talk, think, and reflect," said Marianne Lettieri, founder of Arts of the Covenant. "We hope this show of angel art will be an enjoyable experience for families to begin their holiday celebrations." The exhibit can be previewed at http://www.blurb.com/bookstore/detail/898264. Arts of the Covenant includes more than 100 visual artists from all around the San Francisco Bay Area who meet monthly in Menlo Park to discuss the intersection of art and Christian faith. For more information about the group, contact Marianne Lettieri, mariannelettieri@yahoo.com, 650-328-5754.